The first time I picked up this book, I knew I would love it. The cover is beautiful and the actual paper that the words are printed on is thick and glossy and filled with gorgeous photos! It's an experience just turning each page! I knew this book would pull at my heart strings because it's a memoir written by a mother of a child with Down Syndrome and both of my children are on the autism spectrum and my son has a seizure disorder as well. And boy did it ever pull -- this story brought me to tears several times throughout! But keep in mind for all of you that don't want to read heavy material, not all of these tears were due to sadness or grief. Quite the opposite in fact! Often the tears were shed because of the accomplishments that were met and the revelations that were made by all the amazing people in this family. "Bloom" begins with Kelle Hampton about to give birth to her second child. Kelle is prepared for this adventure beyond imagination -- she has come to the hospital with little thank you gifts to give out to each friend and family member who will be coming to visit once her daughter is born; she has a gorgeous outfit to take her baby girl home in--the same one her first daughter was brought home from the hospital in; she has her music to listen to while going through labor. But within seconds after delivering her baby, she notices something very different about Nella. 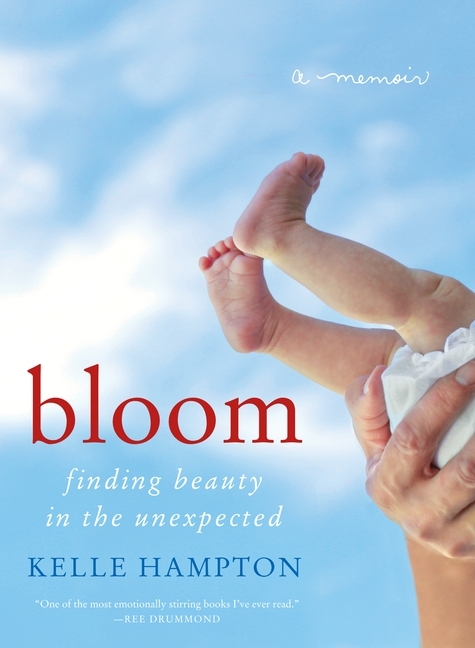 As baby and mom look into each other's eyes, Kelle is sure that the baby she is looking at has Down syndrome. Within hours, this diagnosis is confirmed by the doctor and Kelle and her husband, Brett, are in a tailspin of despair. This memoir takes you through the first year of Nella's life, and all of the many, many ups and downs their family goes through. There are a lot of tears, many laughs, an amazing group of friends and family who offer the most outstanding amount of support, and copious bottles of beer consumed in this book. The story is mainly told from Kelle's point of view and her intense journey of transformation and it is written with such raw emotions unlike anything I've ever read before. One of the most emotionally moving books I've ever read! Even if you don't have a child with special needs or know someone who does, I highly recommend you read this. This story will take you on an excursion that will make you think of your life like you never have before. You will be inspired by Kelle's drive and determination, her passion for life. You will question whether you are living your life with enough love, with enough goodness in your heart and with enough passion, and most of all you will fall in love with Kelle and her daughter Nella. This is an absolutely beautiful book!!! Kim Walker is a wife and stay-at-home mother of two children who both have autism and her son also has a rare seizure disorder called Dravet Syndrome. Kim and her family reside in Calgary, Alberta, Canada, and when she manages to find some time for herself, you can bet she has her nose buried in a book. If you'd like to talk about books with Kim, you can find her on Facebook. She's also a regular visitor to our Facebook group! This is her second guest review for Chick Lit Central.